This question is thus primarily concerned with the equilibrium shapes formed by paper and paper-like objects (analogous to minimal surface theory in relation to soap-bubble models). Anyone know references for this topic? The Möbius strip you show is a developable surface. No one, as far as I know, has been able to create a parametrization of it. 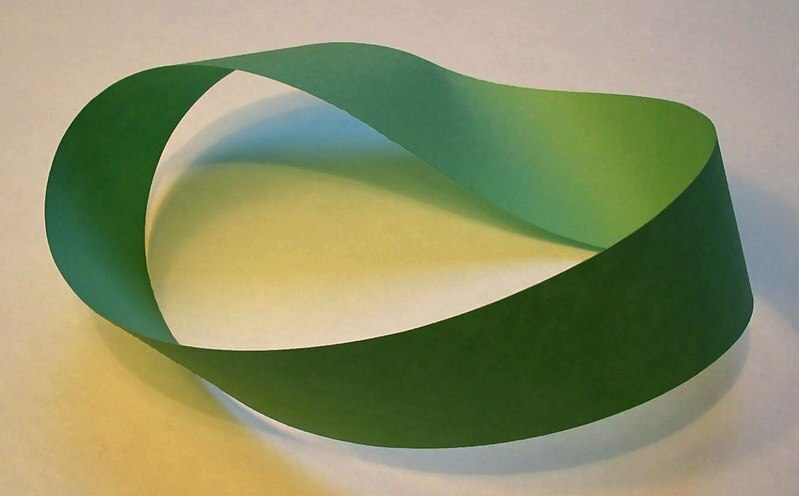 Since 1858, when the Möbius strip was discovered, mathematicians have been looking for a way to model it. The problem was finally solved in 2007 by E.L. Starostin and G.H.M. van der Heijden. MJD, since you refer back to the original question, and given your previous comments, I assume you are trying to be provocative. However, your question does address a very common misconception. In a sense, the same one addressed by the original question. It is common to think that the Mobius strip that can be modeled by giving a strip of paper a half-twist and joining the ends is described by the parametrization you give. There are some very real differences between the two that help explain why this isn't so. The parametrization describes a Mobius strip whose center line is a circle.The paper model is like the recycling symbol and has a triangular center line. The parametrization describes the path of a straight line centered on a circle; the straight line travels around the circle and completes a single 180 degree rotation (half twist) by the time it returns to its starting point. At no time is the straight line ever bent in 3D space. If you draw straight lines crosswise on a strip of paper, then make a model of a Mobius strip, you will discover that in the three corners those lines are bent in 3D space. If you take the time to look seriously at those corners you will discover that each one incorporates a half twist. So a paper Mobius strip actually has three half twists. If you cut the paper model in half crosswise, it will revert to being a flat strip of paper. The Mobius strip being modeled is therefore developable. If you cut a model of the parametrization in half, it will not lie flat. It is not developable. To answer your question, the reason I say no one has created a parametrization of a developable Mobius strip, is because as far as I know no one has. As I pointed out, E.L.Starostin and G.H.M. van der Heijden have been able to mathematically model a developable Mobius strip; but their model is not a simple parametrization. I suggest you go back to your university and point out that they missed the boat on this one. It's as if they told you that topologically a cube, a sphere, and a tetrahedron were the same, then said the formula for a cube describes them all. By the way, these are not the only two geometrical forms a Mobius strip can take. There are more out there still waiting to be modeled mathematically. Not the answer you're looking for? Browse other questions tagged reference-request ordinary-differential-equations physics differential-topology minimal-surfaces or ask your own question. Why is $|\cos\theta d\omega|$ the projection of the differential solid angle $d\omega$ onto the $(x,y)$-plane?